Literacy data published by the UNESCO Institute for Statistics (UIS) in 2007 shows that the lowest adult literacy rates are observed in Africa and South Asia. In some countries, fewer than three out of ten adults can read and write. UIS provides national literacy data for two age groups: youths aged 15 to 24 years, and adults aged 15 years and older. A more detailed analysis of literacy is possible with data from household surveys. Most Demographic and Health Surveys (DHS) collect data on literacy for persons between 15 and 49 years. For male household members, literacy data is sometimes collected up to an age of 54, 59, or 64 years. To assess the degree of literacy, respondents to the survey are asked to read a card with a simple sentence. If a respondent can read the whole sentence, he or she is counted as literate, in accordance with UNESCO's definition of literacy as "the ability to read and write, with understanding, a short simple sentence about one’s everyday life". Recent Multiple Indicator Cluster Surveys (MICS) by UNICEF collect data on literacy with the same method, but only for female household members between 15 and 49 years. MICS surveys are therefore not covered by the analysis that follows. This article examines data from eight DHS surveys that were carried out in sub-Saharan Africa between 2003 and 2006. The survey data is from Benin (2006), Burkina Faso (2003), Cameroon (2004), Lesotho (2004-05), Niger (2006), Nigeria (2003), Uganda (2006), and Zimbabwe (2005-06). The data can be used to calculate overall literacy rates and also to examine trends over time by comparing literacy rates in different age groups. The following table lists literacy rates for the male, female, and total population between 15 and 49 years of age. Zimbabwe (85%) and Lesotho (79%) are the countries with the highest literacy rates, followed by Cameroon (63%), Uganda (58%), and Nigeria (55%). In Benin (33%), Burkina Faso (18%), and Niger (13%), adult literacy rates are much lower. In seven of the eight countries there is a large difference between male and female literacy rates. In Benin, Burkina Faso, Cameroon, Niger, Nigeria, and Uganda, more men than women are literate, with a gender gap ranging from 12% to 26%. In Lesotho, the literacy rate of women is 21% greater than the literacy rate of men. In Zimbabwe, the difference between the male and female literacy rate is only 6%. 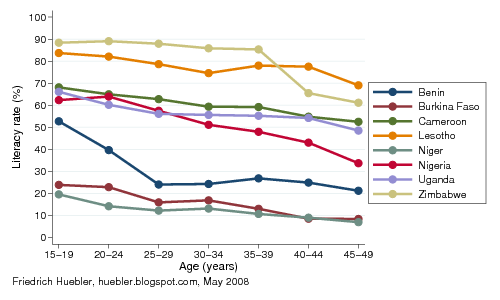 For the graph below, the survey respondents were divided into five-year age groups. In all countries, literacy rates among the younger population are higher than among the older population. The literacy rate of the youngest group, 15 to 19 years, can be interpreted as a measure of the coverage and quality of the primary school system during the 1990s, when the members of this age group were of primary school age. In Burkina Faso, Cameroon, Lesotho, Niger, and Uganda, the difference between the literacy rates of 15- to 19-year-olds and 45- to 49-year-olds ranges from 13% to 18%. These numbers indicate a relatively modest expansion of the education system between the 1960s, when the older age group was of primary school age, and the 1990s. In contrast, in Benin, Nigeria, and Zimbabwe, the difference between the literacy rates of 15- to 19-year-olds and 45- to 49-year-olds ranges from 27% to 32%. These three countries were thus more successful in their efforts to increase the number of literate citizens than the other five countries. In Burkina Faso and Niger, less than one quarter of the population between 15 and 19 years can read and write. However, the case of Benin shows that a large increase in literacy can be achieved within only ten years. In Benin, only 24% of 25- to 29-year-olds are literate but among 15- to 19-years-olds the literacy rate has grown to 53%.